The Nile River is the reason that the ancient Egyptians developed their civilization. The surround areas of Egypt are desert and the Nile River brought water and rich soil that could be used to fertilize and grow crops. The Nile River is considered to be the longest river in the world at 6,853 km and flows in a majority of northeastern Africa. When we see pictures of the Nile, we might think of it as one huge long river, but it actually has two sections that are called ‘tributaries’. These are smaller rivers that run separately and then merge into one river. 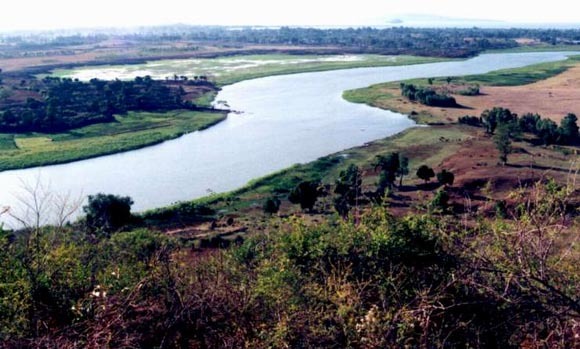 The names of the tributaries are called the White Nile and the Blue Nile. The main stream of the Nile River. Longer and increases in an area of Africa known as the Great Lakes region. The real reason that the annual floods bring dark rich soil to Egypt’s farming areas. The Nile River flows completely through the desert and then ends in what is called a ‘delta’ in Egypt. On its final journey it empties out into the Mediterranean Sea. Scientists have not agreed on where the source of the water comes from that feeds the Nile River. Some thought it might be Lake Victoria which is one of Africa’s largest lakes. But that lake has a number of feeder rivers that they didn’t think affected the Nile. Others think it might be two the feeder rivers themselves that meet near the Rusumo Falls on the border of two African countries: Rwanda and Tanzania. In the times of ancient Egypt there were heavy annual rains near both the White and Blue Niles. The large amount of water from the rain caused both tributaries to fill and move the water into the Nile River. The flooding was the expansion of so much extra water before it had a chance to empty into the Mediterranean Sea. The Egyptians knew the time of the year that the Nile River would flood. They depended on the flooding to bring extra water and the rich soil and dirt that fertilized the fields for growing crops. Since the rains happened almost at the same time every year, the Egyptian civilization and everyday life was based on the flooding of the Nile, the planting and harvesting of the crops. The Nile flooded the area for about three months and then it had time to empty out into the Mediterranean Sea and return back to its normal size and flow. The Nile River was used by the ancient Egyptians to travel in boats for trade to other areas. It was also used to transport items to the various sections of the Egyptian kingdom. It is thought that many of the stones used for the pyramids and the great buildings in Egypt were ‘quarried’ (dug out from the natural rock) and then loaded onto barges and sailed to the location of the new buildings. Pharaohs had beautiful fancy ships built for themselves to travel up and down the Nile for pleasure and relaxation. The Nile River supplied Egypt with a way to have commerce as well as being the source for their crops. Since the Nile River was so important to ancient Egyptian life, they added it as part of their religion. They believed the Nile River was the river way that was taken from life to death and then to enter the afterlife. The east was looked at as the place of growth and birth and the west was part of death. This is the same idea as the sun rising in the east and setting in the west. In the Egyptian religion it was the way their Sun god Ra, traveled to birth, life, death and then to be reborn each day. This is why all of the burial tombs for the Egyptians are on the west side of the Nile. The ancient Egyptians based their calendar on the three cycles of the Nile River. Each season was four months, each month thirty days.